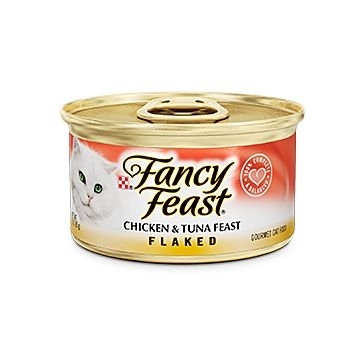 Fancy Feast Flaked Chicken & Tuna Feast 3oz. Fancy Feast Grilled Chicken Feast in Gravy 3oz. Fancy Feast Grilled Salmon Feast in Gravy 3oz. Fancy Feast Classic Chopped Grill Feast 3oz. 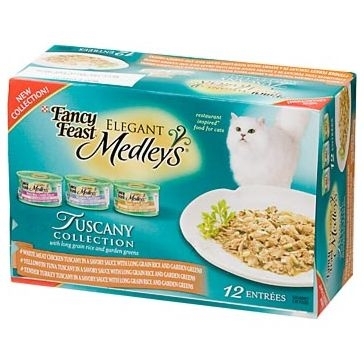 Fancy Feast Classic Classic Chicken Feast 3oz. Fancy Feast Classic Cod, Sole, & Shrimp Feast 3oz. Fancy Feast Classic Tender Beef Feast 3oz. Fancy Feast Grilled Tuna Feast in Gravy 3oz. Fancy Feast Grilled Turkey Feast in Gravy 3oz. Fancy Feast Classic Tender Liver & Chicken Feast 3oz. Fancy Feast Marinated Morsels Chicken Feast in Gravy 3oz. Fancy Feast Classic Ocean Whitefish & Tuna Feast 3oz. 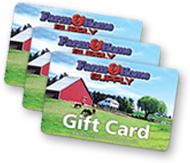 Fancy Feast Classic Turkey & Giblets Feast 3oz. 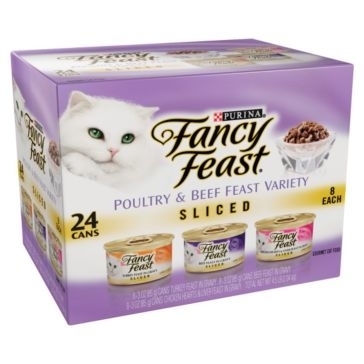 Fancy Feast Delights with Cheddar Grilled Chicken & Cheddar Cheese Feast in Gravy 3oz. 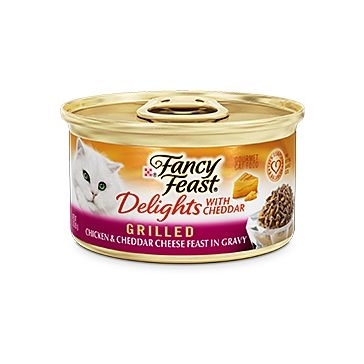 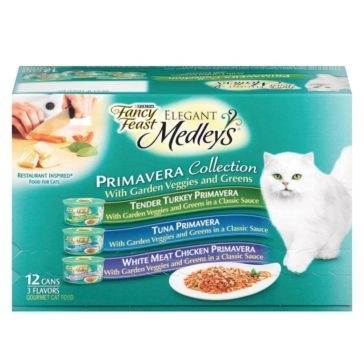 Fancy Feast Delights with Cheddar Grilled Turkey & Cheddar Cheese Feast in Gravy 3oz. Fancy Feast Sliced Chicken Hearts & Liver Feast in Gravy 3oz.